It has been two years since Linux Format magazine last reported on Ulteo. Back then, we all thought it was going to be a standard new Linux distribution created by Gaël Duval, the founder of Mandrake Linux. If you take a look at Ulteo.com today, you won't find any mention of Linux on the home page. Not only that, but everything about the Ulteo site is slightly confusing. It's very difficult to understand what Ulteo is and what it might do, thanks to some rather vague statements and the use of some very stylised 'lifestyle' illustrations. But Ulteo is actually four distinct technologies. You'll see a reference to the 'Ulteo Online Desktop' and the 'Ulteo Application System' on the main page, and behind the scenes you can also download two further tools called the 'Ulteo Virtual Desktop' and the 'Windows Document Synchroniser'. Each of these use Linux to a greater or lesser extent, but not in the way you might imagine. Rather than offering a simple email service, or even an office suite of applications, the Online Desktop is more ambitious. As its name implies, it's a desktop that can be accessed through a web browser. Your session is stored on the Ulteo servers, and you can access your desktop from anywhere with an internet connection as well as share the session with other people. It's thin client computing without the corporate shell, and Ulteo.com markets the whole package as a 'My Digital Life Made Simple'. After the online desktop comes the Ulteo Application System. This is designed to complement the Online Desktop by offering a local installation. Your first thought might be 'Aha! Here's the long-awaited Ulteo Linux Distribution', but things aren't quite as they first seem. It's very difficult to find any information about the Application System without installing it, and when you do, you quickly realise that this is an offline version of the Online Desktop rather than being a standalone distribution. It's tied to your online Ulteo account, for example, so if you happen to travel a lot, or commonly use more than one machine, this could be a real boon. But we're getting ahead of ourselves. Without the Online Desktop sitting at the centre of the Ulteo vision, none of the other elements would make any sense. Firefox and Internet Explorer are officially supported, and you also need Java runtime 1.5+ installed (there are some reported problems with Ubuntu's 8.04 Java package). Ideally, you also need a broadband internet connection, but the quality of the desktop adapts to changing network conditions, much like VNC, and dial-up speeds are supported. After you've created an account on Ulteo.com, you then need to click on the 'Start Now' button. This takes to you a further page that lists the four core Ulteo technologies. The first two offer virtual desktops, while the second offer the offline desktops. Clicking on the Online Desktop option takes you to a further page where you can fine tune your language and connection settings, and it's from here you can finally launch the Java application that will contain your desktop session. A few moments later, depending on the speed of your connection, you'll see your first view of the Ulteo desktop. This is a complete and isolated Linux session that's piped to your session window from somewhere in the internet, and it's possible to configure a web proxy if your machine is running behind a restrictive firewall. 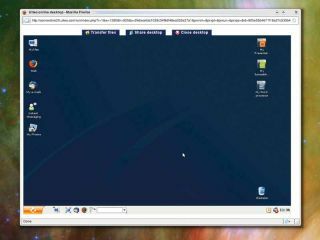 If you've ever used VNC for desktop sharing over a network, it will feel very familiar. There's the same kind of JPEG artefacts that hang on to the edges of the graphics, blurring the definition sightly, and the screen will update in blocks of graphics, rather than a more intelligent window frame approach as used by NX, for instance. But unlike NX, there's no sound support, although that is promised in a future update. If you're using a 1- or 2MB broadband connection, the desktop is reasonably responsive.